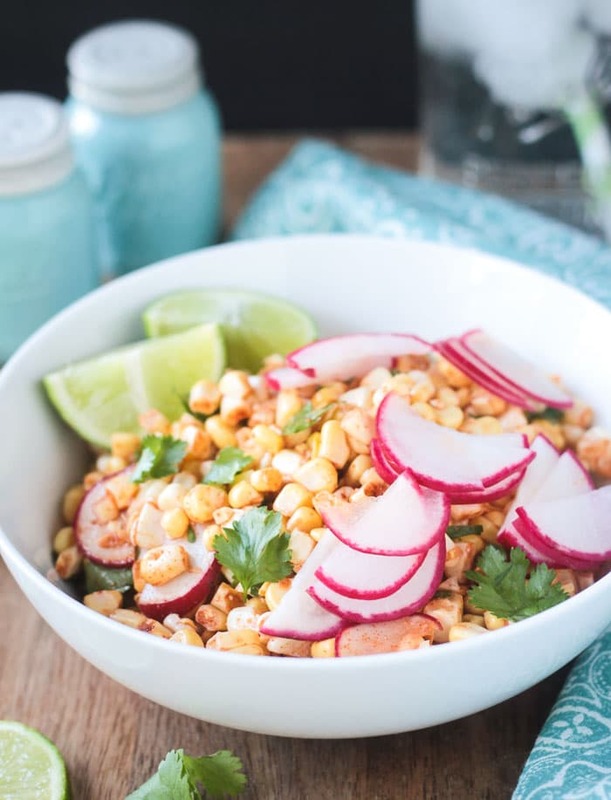 Raw Corn and Radish Salad – Make the most of summer’s finest with this surprisingly flavorful, yet simple, salad. Fresh sweet corn is at it’s finest right now. I’ve mentioned before and I’ll say it again – we are so lucky to have an amazing farm just down the street. They have the best sweet corn and every summer I look forward to their announcement saying it’s ready! Well, it’s ready, and we’ve been eating corn on the cob with almost every meal. Can’t. Get. Enough. And watching little kids eat corn on the cob is one of the funniest things ever. Seriously. It’s bigger than their little faces and they are covered in corn from chin to forehead almost immediately. Anyway, did you know that fresh sweet corn is delicious raw? Well, it is. And that’s how I use it in this surprisingly simple, yet flavorful Raw Corn and Radish Salad. 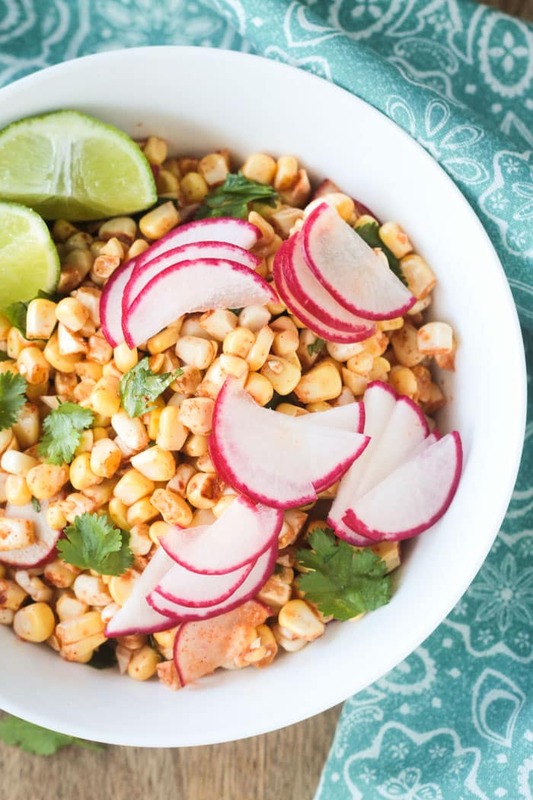 This corn radish salad is so super simple. The hardest part is cutting the corn from the cob and trying not to have corn kernels flying all over your kitchen. Pro Tip: Try placing a small bowl upside down inside a large mixing bowl. Stand an ear of corn up on the small bowl and cut the kernels off. They should land in the bigger bowl without making too much of a mess. I can’t remember where I learned that trick, but it’s a good one! I have made this salad numerous time for BBQs and picnics and it’s always a well-loved dish. I gotten lots of compliments on it and everyone always asks for the recipe. Well, finally, here it is! You can even make this ahead of time and keep it in the fridge until you are ready to serve. Just be sure to mix it up again right before serving. I love the way the spicy radishes mingle with the sweet crisp corn. Add to that some bright citrusy cilantro, smoky spices and lime juice and you’ve got a winner for the whole family! The sweetness of this salad recipe really relies on the fresh corn. Make sure you use the freshest, sweetest corn you can find. You can certainly make this salad with thawed frozen corn during the winter months, but you may need to adjust the seasonings and even add a little sweetener. 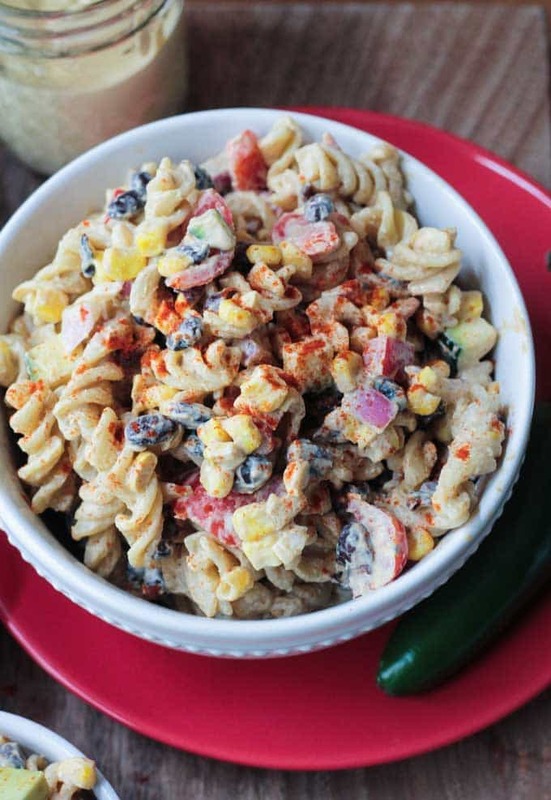 This corn salad is the perfect accompaniment to any BBQ, picnic, potluck or party. Or cut the recipe in half and whip it up for a simple lunch just for you and a friend. I’ve sent this salad in my son’s lunchbox before as well, and it’s always gone at the end of the day. Give it a try this weekend and let me know how much you love it! 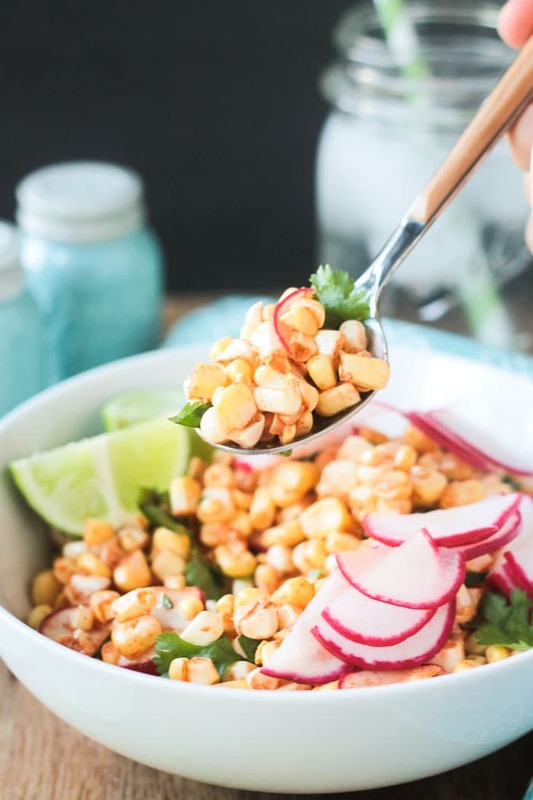 I hoe you love this Raw Corn Radish Salad as much as we do. If you try it, please come back and leave me a message below with your feedback and star rating. You can also find me on social media. Be sure to tag @veggie_inspired and #veggieinspired so I’m sure to see it. Enjoy! 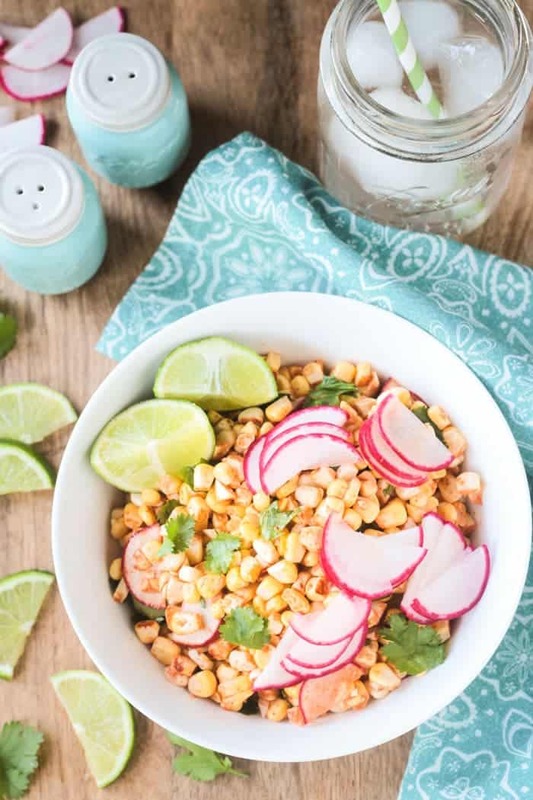 A surprisingly flavorful simple raw corn and radish salad perfect for summer. Combine all ingredients in a large bowl and toss to mix well. Taste and adjust seasonings as needed. *This post was originally published in August 2015. Photos were updated May 2017. Original recipe and content remains the same. I don’t think I’ve ever eaten raw corn! I bet those peppery radishes really compliment those sweet kernels nicely. It really looks so fresh-tasting, too. I remember being shocked when a farmer told me I could eat it raw. Obviously, it’s best when local and super fresh! We have delicious vegan corn in season here in NJ right now – this is the perfect recipe for it! Perfect! Nothing better than fresh summer sweet corn! This looks so delicious Jenn! Fresh sweet corn is so good in season and I love your addition of radishes. I wish I had a farm right down the street to get tasty fresh veggies too! Thank you! Yes, the farm is an awesome perk! I grew up on Jersey corn and it is the best! Love it! Can’t wait to try this yummy looking salad! We have amazing sweet corn here in the midwest too. A summer favorite! Thanks, Sarah! I love this salad! It’s one of my summer favorites. I’m glad you like radishes as much as I do! LOVE radishes! That spicy bite…can’t get enough. Thanks, Amy! I hear you! Fresh corn is the best and one of the highlights of summer. This salad looks incredible. Thanks for the recipe! Thank you, Sarah! I can’t wait for more! YUM! Raw corn is such a summer treat. Can’t wait to try this salad! It was so surprising to me when I first had it raw about 10 years ago. I had no idea before that that it’s sooo yummy! The best! Thanks, Becky! Delicious! We used a white elephant radish so it wasn’t as pretty. It is a nice refreshing salad when it’s too hot to turn on the stove. Oh, great, Barbara! I’m so glad you liked it! 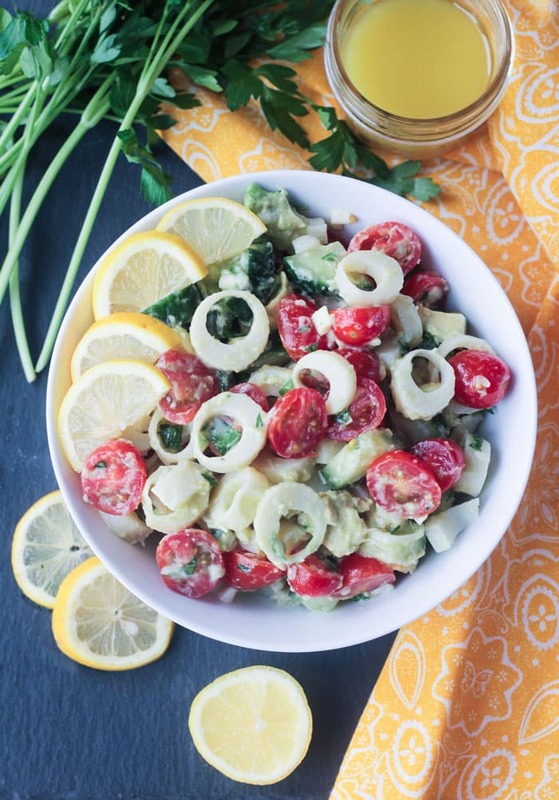 It’s one of my go-to salads for the summer! I totally agree, Jenn, little kids look adorable when they eat corn on the cob. Adults, not so much. 😉 This salad is so up my alley. I love corn, and the hot radishes with the sweet, yum! Thanks, Linda! And, yeah, adults…with the corn silks stuck in their teeth…not so much! LOL! 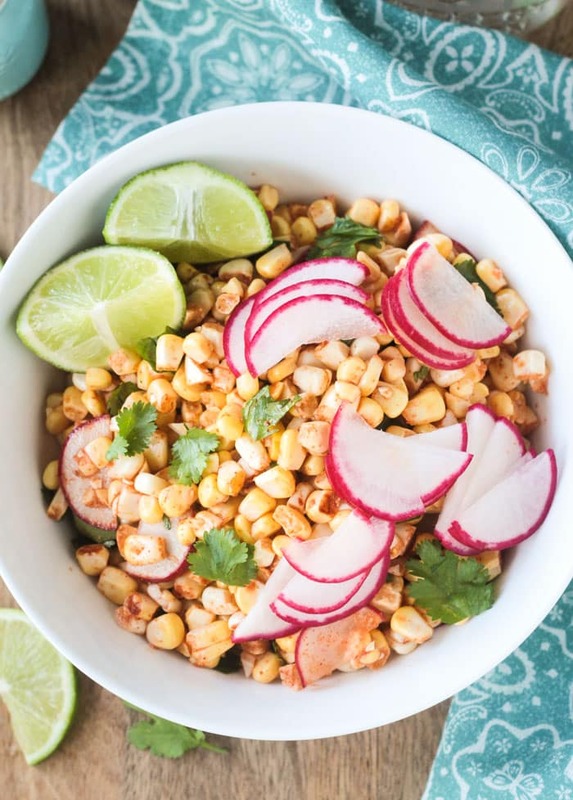 I love corn and I love radish so this salad is right up my alley! :)Love it! Thanks, Manali! Fresh sweet corn in the summer just can’t be beat! Sweet corn is the best this time of year. It’s like a summer tomato in that it should almost have a name of its own, because the flavor of it off-season can’t even compare. This salad looks like a great way to enjoy it. I’m keeping that in mind for my husband’s lunch that I pack. So true, Cadry! I was just thinking that same thing about tomatoes today when I picked a cherry tomato straight from the vine in our garden this afternoon. It is so incredibly sweet. Grocery store tomatoes in the winter are actually pretty gross compared to the sweetness that is the summer vine-ripened tomato. And, yes, the same goes for summer sweet corn. I hope you love it! Yes, we are very lucky!! It’s such a cute fun farm too! The owner is always around followed closely by his beloved dog, Susie. Their corn is so amazing, but they are actually known for their strawberries…..so good….and they let you go out on the wagon and pick your own. Love it! My second favorites spice <3 Smoked Pap! So good! And summer corn is just the best! I've been cooking a lot with radishes lately too! 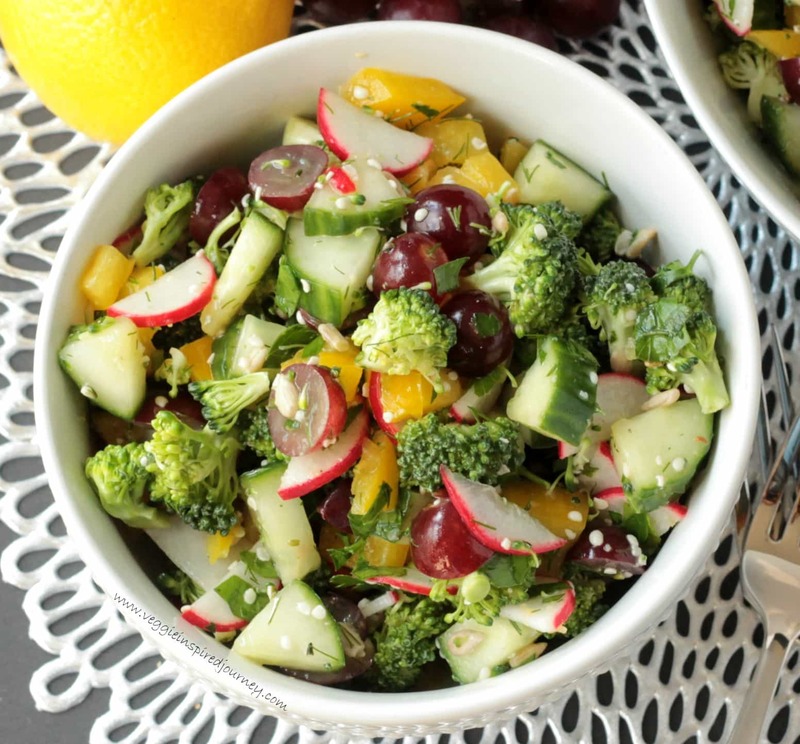 A fun colorful veggie to add some crunch!